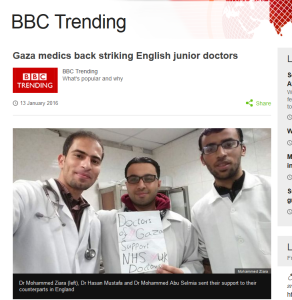 On 12 January 2016, the NHS junior doctors went on strike. As is the norm these days, a social media campaign of people posting pictures of themselves with signs of solidarity took place. In Shifa Hospital in Gaza, Dr-Abu Rayan Ziara, a ‘recently qualified’ Palestinian doctor also posted a tweet, with a photo of himself and some colleagues holding a sign that stated: ‘Doctors of Gaza support NHS UK doctors’. 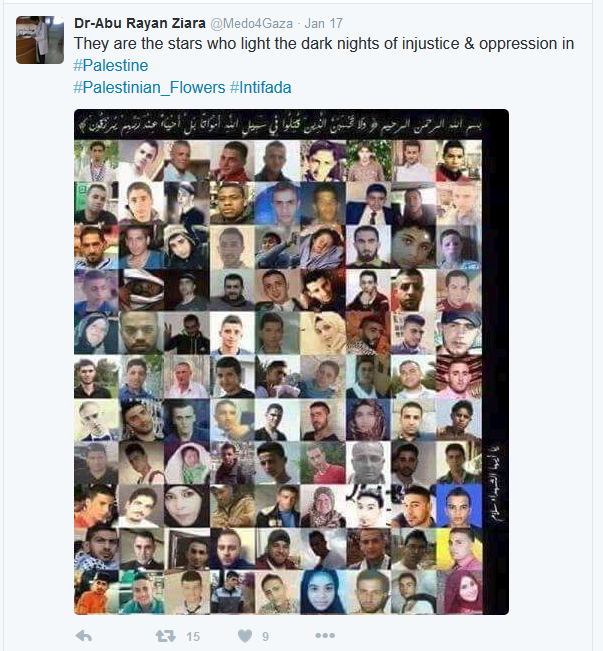 It received some twitter attention from the Pro-Palestinian propaganda crowd, begging to be picked up. Sure enough the BBC ‘trending’ site, published a piece by Mario Cacciottolo, a reporter of sorts who describes himself as a ‘BBC News multimedia journalist.’ From the attention given to it by the BBC, as these things usually do, the story spread to other news networks. As a site that focuses on BBC bias pointed out at the time, ‘this was hardly much of a ‘trend’, let alone actual news’. With the rise of social media and online news channels, there are far too many wannabee reporters desperately seeking something, anything to write about. Asking for absolute standards to be maintained at all times is perhaps a ‘big ask’. Unless of course it was clearly ‘propaganda bait’, waiting for someone stupid enough to pick it up. So let’s focus on the doctor himself, Dr-Abu Rayan Ziara. 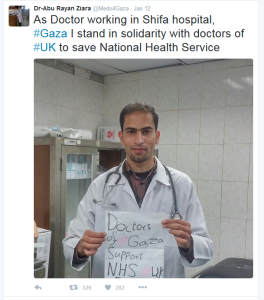 Last July ‘Brian of London’ picked up on another Tweet from the ‘good doctor’, which accused Israeli soldiers of leaving a Palestinian ‘bleeding to death’ after shooting him from close distance. As the hard hitting blog pointed out, the Palestinian concerned, had actually just attacked someone with a knife, seriously wounding him. In addition, the terrorist was treated on the spot and taken to a hospital for further treatment. On the ‘Doctor’s’ twitter feed, the counter evidence was quickly highlighted to him, but the tweet was neither edited nor deleted. So it seems the Doctor does not seem to be your usual ‘run of the mill’ doctor. In fact, you cannot put this man’s name into Google without realising there is a little more to it than meets the eye. And then you ask yourself, ‘don’t BBC reporters do this as part of basic guidelines’? Isn’t it obvious? So you begin to look at other Tweets, almost all in English, and almost all clearly propaganda. And his name then appears quite frequently in news reports throughout 2015 on RT, Jewish News, in blogs, and other various outlets. These Tweets are from the 9th October, at the time of clashes on the Gaza border between Israelis and Palestinians. They are several tweets announcing that there have been clashes, that the casualties are arriving at the hospital and everyone is on high alert. The tweets cover a full hour. He carried on posting beyond this. 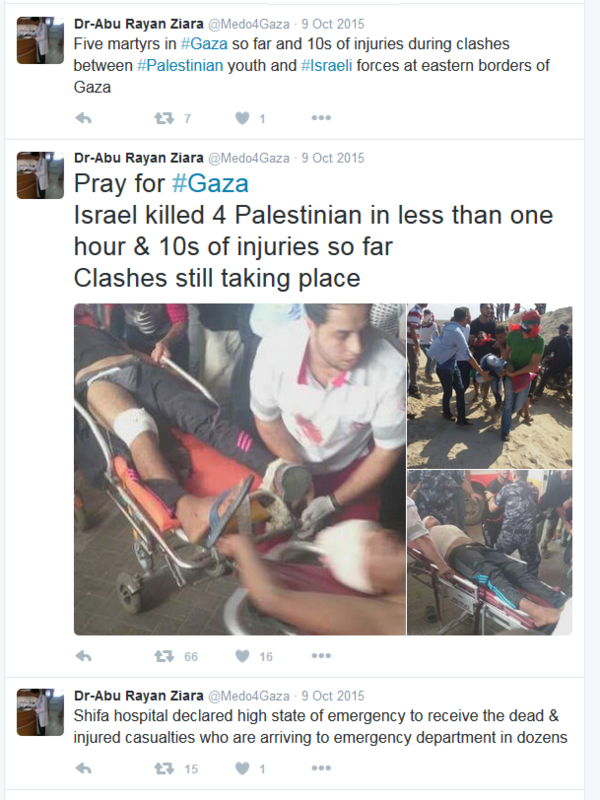 Does anyone else know of a doctor working in such conditions, who at the height of the clashes, at the very point that the injured get brought into hospital, spends his time on Twitter? He received photos, uploaded them and posted them at the same time as the dead and dying were waiting to be treated in his hospital? The empty claims from his Twitter feed are incessant. But so is his support for the terrorists. Our good doctor is a PR man. Below is a screenshot of another of his campaigns. 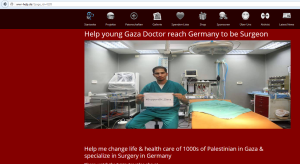 Raising money to help him become a doctor in Germany. One wonders where the money for such campaigns end up. There are 1000’s of activists such as this online. Their activity is as full of lies as it is relentless. This one is particularly prolific and innovative. Reading his timeline, Dr-Abu Rayan Ziara is clearly part of the factory that outputs the anti-Israel propaganda. And at sometime on the 12th January, he had an idea. He scrawled a note on a piece of paper, grabbed a couple of his friends, picked up a camera and sent out the tweet in the hope that someone, anyone would be stupid enough to pick it up. 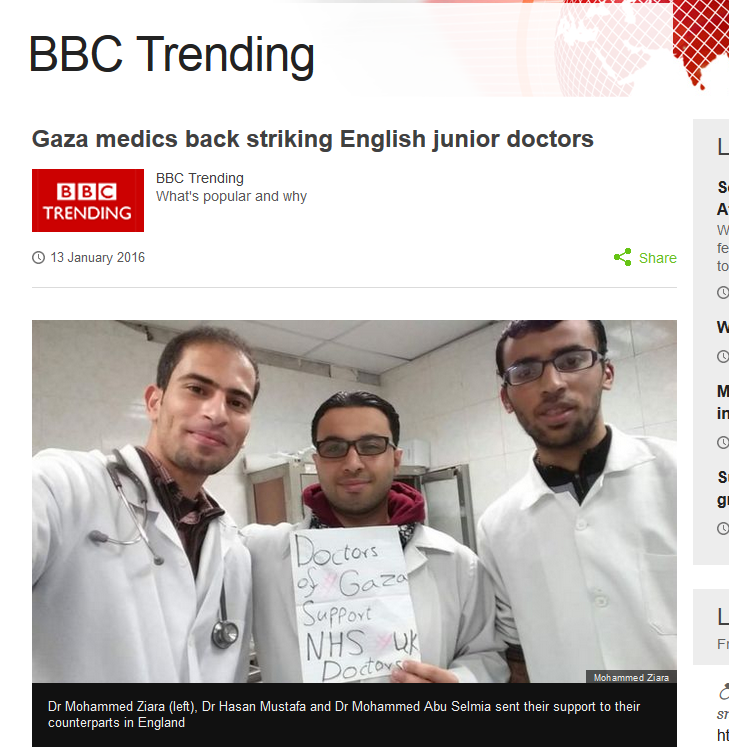 And along came Mario Cacciottolo from the BBC, from the pen of a Hamas PR man to the pages of the BBC website. The damage has been done. A terrorist supporting propagandist, has elicited more sympathy for the Palestinian cause simply because the BBC have become willing and blind accomplices. 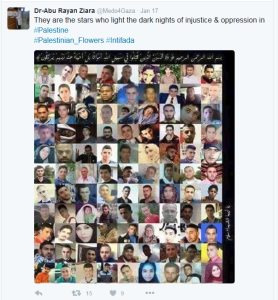 They fell for a PR trick and spread the work of a PR man for the Palestinian cause, undiluted. The ‘reporters’ who regurgitate the spin do not perform even the most cursory of background checks. 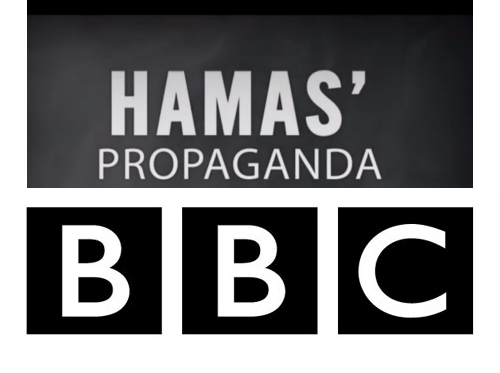 Our taxes funded unfiltered Hamas propaganda without the BBC even blinking. These jihadis are warring against more than the infidel and anyone Jewish, but they have waged a war on truth, reality and fact. A war on history and archeology. Hideously apartheid against women, racist Islamists frame the most humanitarian country, a nation where Arabs, mostly Muslim, form 20% of the population and have all the same rights, freedoms, opportunities as all Israelis of any nationality. But I suspect only to make it easer for them to kill jews, sadly. No muslim must ever be trusted. 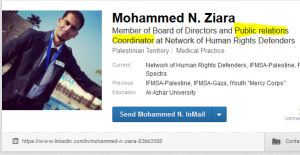 Are these the “doctors” spearheading the campaigns tn to delegitimise and boycot Israeli doctors? It is an interesting correlation. Had that news surfaced before the blog, I would have placed it in. At the very least you can accuse the BBC of directly feeding BDS. Where is the matching ‘factory’ that counteracts this anti-Israel propaganda with balanced facts? I understand the point, but people are not interested in balanced facts and whilst you reach 100,000,000 people with an image of a broken child’s body, explaining the complex realities behind the image will never reach an audeince of more than a handful.. The world of social media is something we have never seen before and in a numbers game the truth will almost always lose. I wonder what response has come from the BBC . There are Jews who seem inured to the falsity of statements by Palestinian and Arab propogandists,there are Jews who feel they can agree with defamation of Israel because they ,surprisingly,feel secure because Israel exists.Both those statements depress me. Then there are those who seek to counter false propaganda against Israel,and who deserve much support.More strength to you. Interesting how you describe people looking to fight back against the occupation forces in their own country as ‘terrorists’. How do you justify that under international law?